Light, Medium or Heavy Duty – we have you covered. Our Light Duty Wreckers carry Dollies which enable them to lift all four wheels off the ground and cradle your car in the air for safe transport. Our larger Wreckers can handle buses, RVs, dump trucks and even 18 Wheelers. 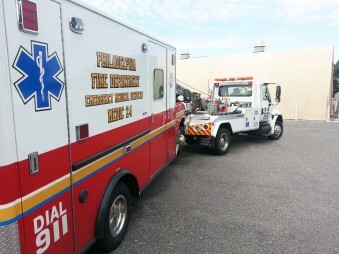 We are currently contracted to tow for a number of municipalities, police departments, ambulance companies, fire stations and private companies. Ask us about how we might be able to serve your company or organization today with dependable contract wrecker service. K & S Towing is locally owned and operated. We are proud partners of AAA Emergency Service and Geico Insurance Company. Call us today to find out more about how our business can serve your business.